THE FIRST DEFINITIVE HISTORY OF TENNIS’ JOURNEY FROM UPPER-MIDDLE-CLASS HOBBY TO GLOBAL TV SPECTACLE. Ever since young men and women first gathered on vicarage lawns to play tennis, this most Victorian of games has always had a peculiarly passionate undercurrent. Whether it’s Roger Federer’s fervent fans or Woody Allen meeting Diane Keaton courtside in Annie Hall, there’s romantic potential everywhere you look. And, of course, love even makes it into the scoring system. Taking in all the exceptional players, trendsetters and forgotten heroes, leading academic and lifelong tennis fan Elizabeth Wilson charts the history of tennis against the parallel march of modernity, globalisation, commercialisation and gender equality across the twentieth century. 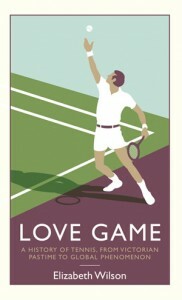 So whether your idol is René Lacoste, Martina Navratilova or Andy Murray, Love Game is the essential account of the rise of the world’s most glamorous sport.